There are some small Bathrooms out there; you know, the kind that make you feel like you have to lose 5 pounds to enter them. Working on this type of bathroom design can get a little complicated at times. Trying to make everything fit in the available space is like doing a giant crossword puzzle. Among the challenges: configuring the toilet and sink to code, allowing enough clearance for a shower and, of course, where to put the towels and toilet paper holder. Despite the challenges, in most cases it’s still better to squeeze in an extra bathroom where one is desperately needed, even if it must be small. 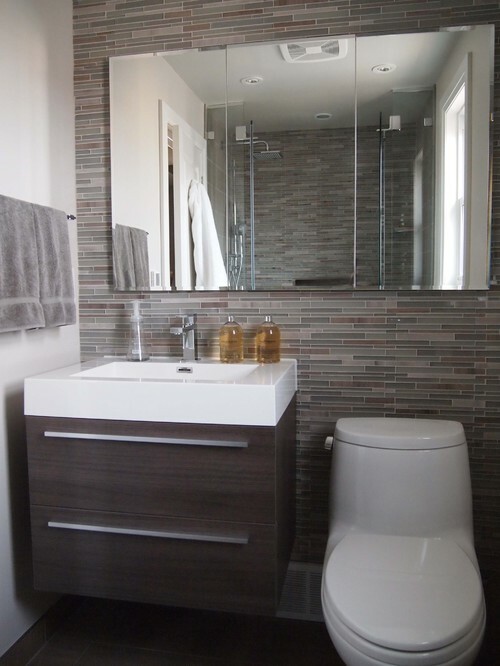 Here are some tips for designing a small bathroom. No need to loose the 5 pounds. 1. Install a corner sink. Sometimes even a pedestal sink can disrupt the only available traffic lane in a bathroom. In this case placing a corner sink across from the toilet works better than a sink across from the shower. The opening and closing of the shower door usually creates an awkward walk-around condition. 2. Use a shower curtain. 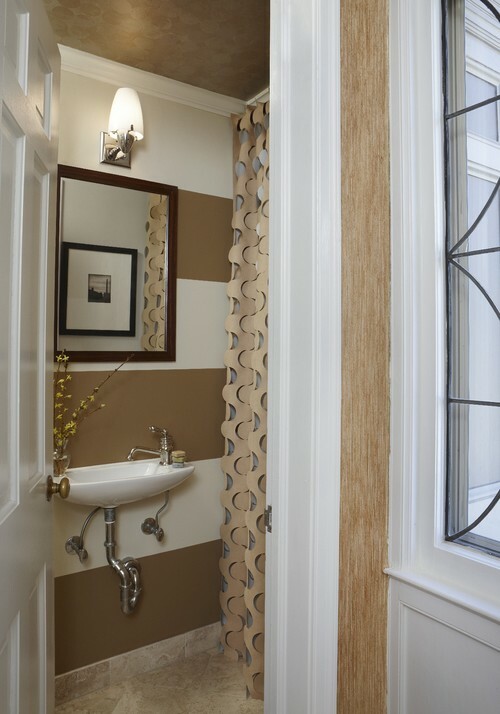 A shower curtain that moves back and forth saves space over a glass door that moves in and out. 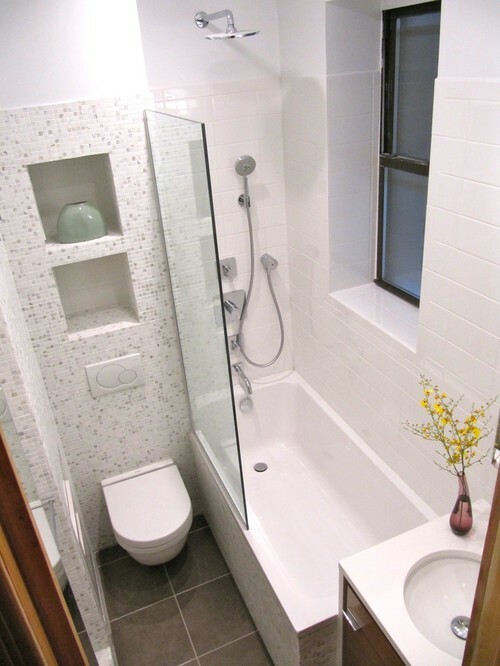 Shower-tub combos actually can fit into small spaces, with some tubs coming in at 60 inches in length. 3. Extend the counter over the toilet. This banjo-style arrangement can be done with stone or a wood slab. The extended counter creates just enough space for a few needed items. Toilet placement is not affected, and the look is minimalist and clean. 4. Use a large-scale pattern. A large-scale pattern, like this wide stripe, can trick the eye into seeing expanded space. 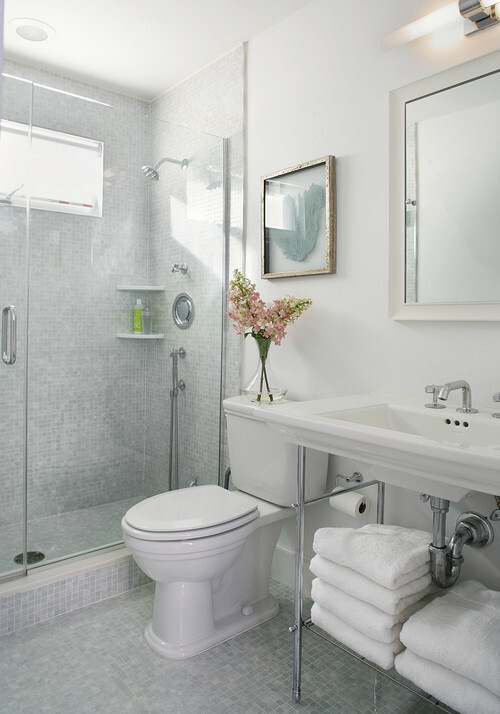 The square footage might stay the same, but the bathroom will feel bigger. 5. Skip the shower door. 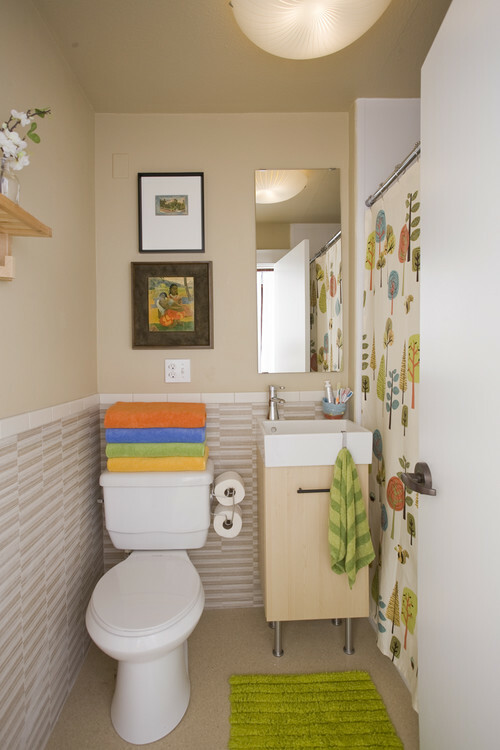 If your bathroom is about 5 feet wide, that’s just enough space to squeeze in a toilet and a 30- by 60-inch tub. 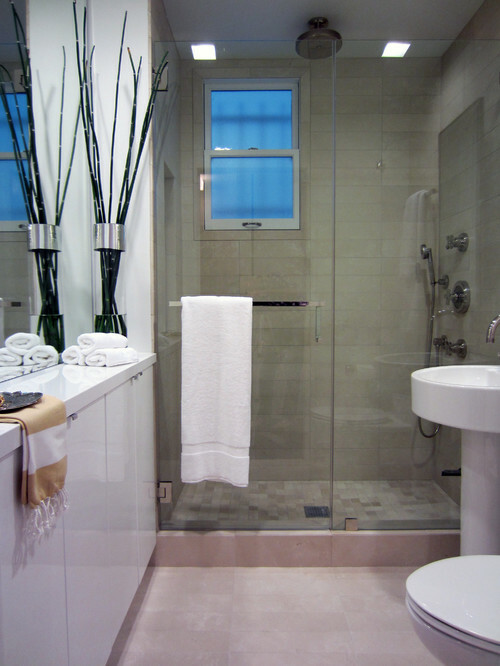 With tight conditions such as these, consider a glass panel instead of a glass shower door. It will keep most of the water in the shower and will free up needed elbow room. 6. Expand the mirror. In the tightest spaces, having a mirror stretch across the wall instead of just the vanity can enable two people to use it at once. In less-than-ideal space conditions, every inch helps. 7. Mount the towel bar on a door. Where can I put my towels? I wish I had a nickel for every time I heard that question. When space is at a minimum, mounting a towel bar on the shower door keeps towels handy. You might need to store the bulk of your towels in a nearby linen closet, but having that one towel close by to dry off with is essential. 8. Select a vanity with one shelf. Pedestal design has gotten smarter. Even a pedestal style with one shelf can hold towels or a basket for toilet paper. I personally love the way fresh, clean towels look folded neatly in a bathroom. 9. Use a wall-mounted faucet. Mounting a faucet on the wall allows for a narrower sink or vanity, which in turn frees up square footage in the total bathroom. 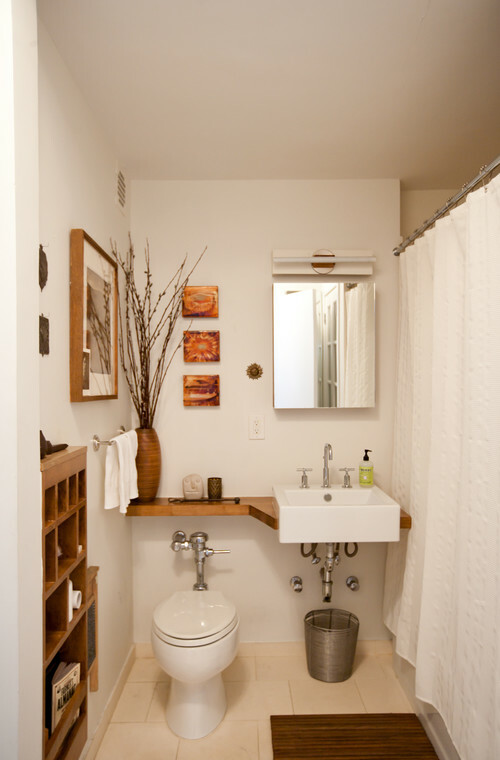 Don’t be afraid to try a wall-mounted faucet in traditional design. It works anywhere! 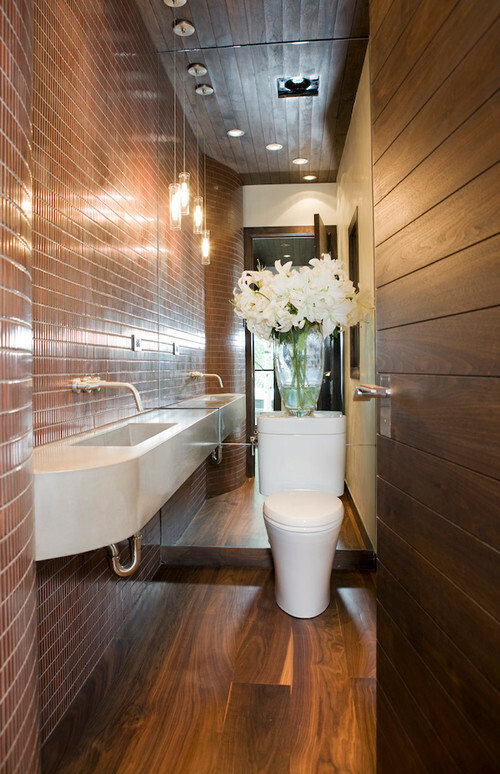 Designers: Please share your latest small-bathroom design tip below! My wife and I are looking at remodeling our bathroom and these pictures have helped. We like how you use the toilet placement to make it look simplistic. Thanks for all the tips. 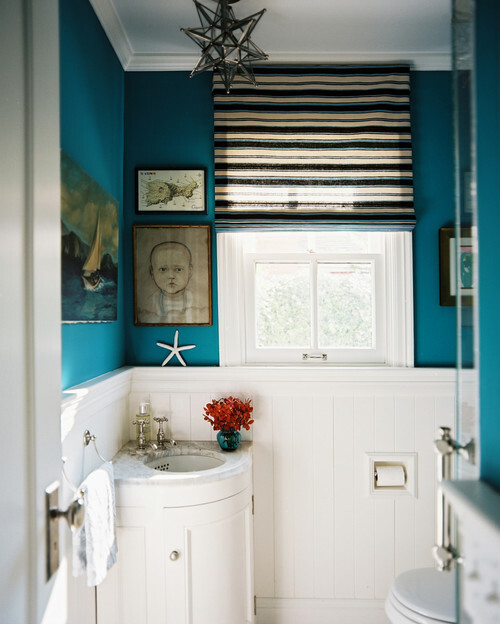 With some creativity and a few designer tips, you can make a small bathroom look bigger and feel brand new. Mirrors definitely is a great contributor to making a room look bigger.